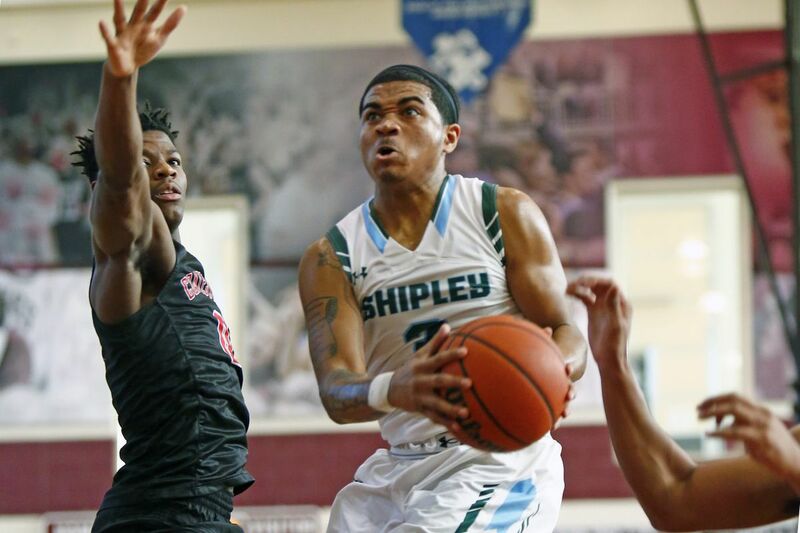 Shipley’s Sam Sessoms surpassed 2,000 career points on Tuesday. Binghamton University recruit Sam Sessoms surpassed 2,000 career points in Shipley's 55-42 win over Friends' Central in the Friends Schools League semifinals on Tuesday. Sessoms finished with 37 points Tuesday to bring his career total to 2,026. He's the first local player to accomplish the feat since Maurice Watson (2,356) did so in 2012 at Boys' Latin. Other local stars to reach the benchmark include Kobe Bryant (2,883 at Lower Merion), Maureese Rice (2,601 at Strawberry Mansion), Wilt Chamberlain (2,252 at Overbrook), Wayne Ellington (2,211 at Episcopal Academy), and Dalton Pepper (2,207 at Pennsbury). The Gators will play Westtown for the Friends Schools League title on Friday at La Salle University. Westtown beat Academy of New Church, 56-36, on Tuesday. Jaimer Graves led with 16 points as Motivation took down Central, 64-53, in Bracket A of the Public League playoffs. Nasir Dixon added 14 points for Motivation, which will face Sankofa Freedom on Friday. In other Bracket A action, Kasiem Andrews recorded 15 rebounds and seven blocks in Dobbins' 59-34 victory over Bodine. Dobbins will face Mastery North on Friday. School of the Future held off Philadelphia Academy Charter, 51-50, in Bracket B play. Kygil Blount, Demingo Mcdaniel, and Devonte Taylor had 14 points apiece for School of the Future, which will play Constitution on Friday. Elsewhere in Bracket B action, William Pope made five three-pointers en route to a career-high 19 points as Strawberry Mansion outlasted Prep Charter, 76-73, in three overtimes. Jaden McCaskill scored all five of his points in the third overtime period for Strawberry Mansion, which will play Lincoln on Friday. Naheem McLeod notched 27 points as Plymouth Whitemarsh defeated Cheltenham, 88-65, to win its fifth straight Suburban One League American Conference title. Tyler Mish's three-point play with 20 seconds left in the second overtime period gave Holy Ghost Prep a 44-40 win over Lower Moreland. Jake Nelson reached 1,000 points for his career, but West Chester Rustin lost to Great Valley, 52-39. Great Valley won the Ches-Mont League American Division title. Larry Pear scored 16 points as AIM Academy defeated Del-Val Friends, 61-54, to win the Tri-County League American Division. Maggie O'Hare had 19 points as West Chester Rustin beat Great Valley, 49-40, to win the Ches-Mont League American Division title for the first time since the 2014-15 season. Maura Conroy's three-pointer in the final seconds of overtime gave Gwynedd-Mercy a 55-53 triumph over Villa Maria. Conroy ended with 15 points. Paige Mott filled the stat sheet with 13 points, 10 rebounds, and five blocks as Abington Friends got past Westtown, 51-38, in the Friends Schools League semifinals. The Kangaroos will try to defend their FSL title against Moorestown Friends on Friday. Katie Anderson scored a career-high 25 points as Agnes Irwin held off Baldwin, 49-39. Mary Grace Miller added 10 points.